No. 21, Jalan Ramin 2, Botanic Business Gateway, Bandar Botanic, 41200 Klang, Selangor, Malaysia. With over 20 years of industry experience, ISAF is your one-stop safety equipment provider and we offer only quality safety equipment to protect you & your human resources’ assets. Based in Klang, ISAF has the necessary infrastructure to develop and supply high quality safety products that conforms to both local & international quality requirements. To achieve that, ISAF’s products are SIRIM (Malaysian Standard), CE (European Standard), ANSI (American Standard) and AS/NZS (Australian & New Zealand Standard) certified. We at ISAF are fully committed to assist you with all your safety requirements. We are dedicated to provide the utmost quality in our products because there is no second take in human lives as well as your employees’. As a result, your company can have peace of mind and accomplish better productivity through ISAF’s personal protective equipment (PPE) & safety products. Quality is our top priority and it is the basis in all our activities. From the information, materials and people we gather, we place great importance in quality. From the day it was founded & formed, ISAF always supports high quality products and services. 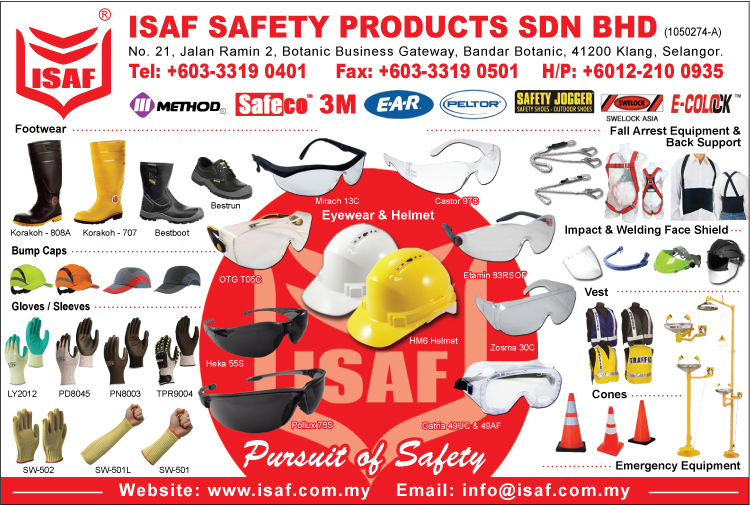 ISAF provides a wide variety of PPE / safety equipment such as Head Protection, Eye Protection and Face Protection which are locally manufactured by our parent company. Also available are Hearing Protection, Respiratory Protection, Hand Protection, Fall Protection, Safety Wears, Traffic Controls, Safety Footwear, Safety Signages and lots more. The products that ISAF provides are not only well-designed, they are also comfortable and yet priced affordably. Our aim is to continually distribute & supply comfortable and well-designed safety equipment and yet do not compromise on safety and keep them reasonably priced for our customers. We offer value by concentrating on the needs of our customers. We also go all-out to provide customers with greater long-term values in our products. Apart from that, we place great importance in making sure our staffs are well-equipped with knowledge, tools and good working environment necessary to help supply better safety equipment and also to better serve you. We will continue to be persistent in practicing the highest ethical values and standards to our products, services and communications.